What are the symptoms of a pheochromocytoma? What conditions are associated with pheochromocytomas? What else can cause the symptoms of a pheochromocytoma? What is the prognosis with a pheochromocytoma? Pheochromocytoma is a relatively rare tumor of the adrenal glands or of similar specialized cells outside of the adrenal glands. Pheochromocytomas secrete catecholamine hormones (adrenaline and related hormones) that are responsible for the characteristic symptoms. Headache, sweating, and a fast heartbeat are typical symptoms, usually in association with markedly high blood pressure. About 10% of pheochromocytomas are malignant. Surgery is the treatment of choice. Pheochromocytomas can occur in combination with other tumors, conditions and in some familial (inherited) syndromes. Pheochromocytomas are a type of tumor of the adrenal glands that can release high levels of epinephrine and norepinephrine. As the name implies, the adrenalglands are located near the "renal" (kidney) area. One adrenal gland sits on top of each of the two kidneys. Despite their small size, the adrenal glands have many functions. 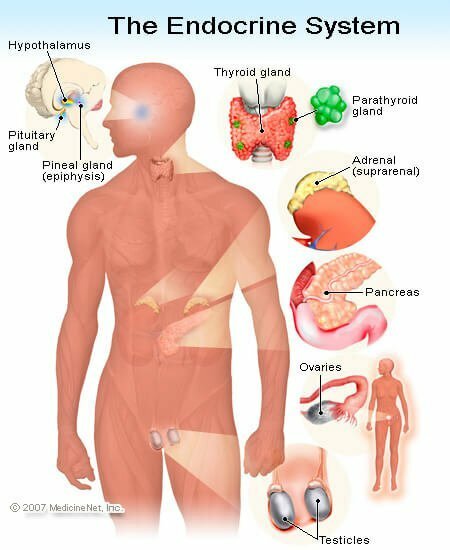 They are complex endocrine (hormone secreting) glands. Cells in different regions of the adrenal glands have different functions in the endocrine system.The outer portion of the adrenal gland is called the adrenal cortex. In part of the adrenal cortex (zona fasciculata and zona reticularis) the cells secrete cortisol, a hormone similar to cortisone, which is essential for handling stresses In another area (zona glomerulosa) cells secrete a hormone called aldosterone which helps in water and salt regulation and blood pressure control. The inner area of the adrenal gland is referred to as the adrenal medulla. This is where the cells secrete substances called catecholamines -- epinephrine, norepinephrine and dopamine. These are "flight or fight" hormones. They are responsible in part for that feeling of an "adrenaline" rush people feel when they are afraid. It is these cells that are overproduced by a pheochromocytoma. Basically, a pheochromocytoma is a tumor of these catecholamine-secreting cells, and that causes the clinical signs and symptoms we will discuss below. The catecholamine-secreting cells are sometimes referred to as chromaffin cells, and they are found in other areas of the body as well as in the adrenal medulla. Sometimes, pheochromocytomas arise from chromaffin cells that are located outside of the adrenal gland. In this case, they are termed extra-adrenal pheochromocytomas or paragangliomas and are usually located in the abdomen. Pheochromocytomas may occur in persons of any age. The peak incidence is between the third and the fifth decades of life. Pheochromocytomas are, fortunately, quite rare, and most of them are benign. Someone with a pheochromocytoma usually has three classic symptoms -- headache, sweating, and heart palpitations (a fast heart beat) in association with markedly elevated blood pressure (hypertension). Other conditions that may accompany these classic symptoms are as follows: anxiety, nausea, tremors, weakness, abdominal pain, and weight loss. Some people, however, never develop symptoms of a pheochromocytoma. Up to 10% of cases are discovered incidentally, meaning that they are not suspected and only found when the patient is undergoing diagnostic studies for other conditions. In some cases, the high blood pressure comes and goes and may be difficult to document. In other cases, the blood pressure is consistently elevated and easily recorded. Pheochromocytomas are present in only about 0.2% of all people with high blood pressure. There are certain conditions, however, in which the diagnosis of pheochromocytoma may rank high on the list of possibilities; they are discussed below. Pheochromocytomas can be a component of certain familial or genetic syndromes. The most common familial condition is called multiple endocrine neoplasia, or MEN for short. Two types of MEN -- MEN 2A and 2B -- are associated with pheochromocytomas. Both are genetic syndromes that run in families and are transmitted from parent to child in an autosomal dominant manner. Pheochromocytomas are not the only tumors that occur in MEN 2A and 2B. MEN 2A carries an increased risk of tumors of the parathyroids, glands near the thyroid that help to regulate calcium levels in the body. And both MEN 2A and 2B elevate the risk of medullary carcinoma of the thyroid - an unusual type of thyroid cancer. In families where MEN is suspected, genetic testing can be done to help identify family members at risk. Pheochromocytomas are a feature of other genetic disorders, including von Hippel-Lindau syndrome and neurofibromatosis type 1. Both of these disorders are associated with the development of numerous benign and malignant tumors. There are also many individuals who have pheochromocytomas with no known family history of them. These cases are termed sporadic. In general, if these patients have bilateral disease (pheochromocytomas in both adrenal glands) or are diagnosed before the age of 21, genetic screening is recommended. Basically, anything that can cause over activity of the sympathetic nervous system can be on the list of diagnoses to rule out when suspecting a pheochromocytoma. The sympathetic system is the main control panel governing the release of the "flight or fight" response in response to stress or fear, as mentioned above. Things that can stimulate this include drugs (even excessive use of decongestants should be considered); withdrawal from drugs (such as suddenly stopping certain blood pressure medications); panic attacks, and spinal cord injuries are among the many conditions that can also lead to some of the symptoms seen in pheochromocytomas. Pheochromocytoma is a possibility in anyone with the classic triad of symptoms -- headache, sweating, and heart palpitations -- especially when there is high blood pressure (though high blood pressure is not always present). A physician becomes more suspicious if the patient is young and has no other risk factors or habits that may cause these findings. Perhaps the patient knows their family history well and can inform their doctor of other types of endocrine tumors, including pheochromocytoma(s) diagnosed in family members. Consequently, a doctor suspecting familial pheochromocytoma can go straight to genetic testing. However, in most cases, if suspicion is high, the physician proceeds with a series of tests to measure the culprit hormones and their breakdown products (metabolites) listed below. First, hormones such as catecholamines and metanephrines are measured in a 24 hour urine collection, and metanephrines may also be measured in the blood. If these are greater than 2 times the normal level, imaging studies are usually done to look at the adrenal glands. If imaging with MRI or CT scans of the adrenal glands shows a mass in the gland (or outside it), surgery may be done. If it is not clear that the mass is actually functional and related to the findings clinically, or if there is no mass seen on imaging, another test can be performed. This test called a 131-I-MIBG scan is quite specific for pheochromocytomas. In this test a radioactive iodine molecule is injected into the bloodstream and localized in the area of the tumor, allowing visualization of the pheochromocytoma on imaging studies. Surgery is the definitive treatment. Until the tumor is removed, control of blood pressure is a top priority. Controlling blood pressure before and during surgery is the trickiest part of care. There is a chance of developing an acute hypertensive crisis (a potentially dangerous, sudden, and severe rise in blood pressure) after anesthesia is given during the surgery. The blood pressure is therefore managed with special medications both prior to and during surgery and is carefully monitored throughout the procedure. Consultation with an endocrinologist is recommended to help design treatment for individual patients. Because of the types of hormones involved in a pheochromocytoma, first attempts at blood pressure control utilize agents of a specific class of drugs known as alpha blockers. These agents are used prior to use of beta blockers to balance and best control the blood pressure response to anesthesia. In the rare instances of pheochromocytomas that are malignant,and not cured by surgery, then chemotherapy or radiation therapy may be required after surgery. Trials of very specific or "targeted" new drugs called tyrosine kinase inhibitors have shown some promise in the treatment of pheochromocytoma and are under study in clinical trials. As yet, drug therapy for this disease cannot offer a possible cure, but may benefit the patient by reducing symptomsand sometimes prolonging life. Pheochromocytoma is benign in most cases, and if blood pressure-related surgical complications can be avoided, the likelihood of cure is excellent. Both malignant and benign pheochromocytomas can recur after surgery. The statistics vary from one study to the next, but recurrence rates average around 10%. Therefore, long-term follow-up care after surgery is very important to keep outlooks fair to good with additional appropriate treatments of medicine or surgery. In the low percent of these already rare tumors in which malignant behavior is evident, survival may still be quite prolonged, as the pace of the disease may still be slow. Participation in clinical trials of new therapies is strongly encouraged in the unfortunate case of metastatic pheochromocytoma. Should a pheochromocytoma be diagnosed during pregnancy, the mortality (death risk) is increased for both the mother and the fetus. Referral as soon as possible to a major center with experience with this circumstance is recommended. WebMD.com. Pheochromocytoma Treatment - General Information. Previous contributing authors and editors Ruchi Mathur, M.D. and Barbara K. Hecht, Ph.D.